The North Dakota Nonprofit Corporation Articles of Incorporation | Form SFN – 13003 are a means of delivering the information required by the North Dakota Secretary of State when forming a nonprofit corporation. No nonprofit corporation may operate as such unless this form has been submitted and approved by the North Dakota Secretary of State regardless of the type of nonprofit corporation being formed. Incorporators are often urged to avoid delays or even penalties by seeking consultation with an appropriate professional before filing these articles. It is worth noting, this document even when approved will not grant Tax-Exempt Status – only the Internal Revenue Service may do this. It is strongly recommended to confer with the Internal Revenue Service before filling out this form, if the nonprofit being formed intends to apply for Tax-Exempt Status at any time in the future. Depending upon the nature of this corporation, other documents may need to be submitted prior to these articles with other institutions, in conjunction with these articles as a result of requirements specific to the nonprofit type, or after these articles as they may be prerequisite for certain paperwork. You may submit these articles either by mail or by fax. If submitting by mail, send to Business Registration Unit, Secretary of State, State of North Dakota, 600 E. Boulevard Ave Dept. 108, Bismark, ND 58505-0500 or you may fax them to (701) 328 – 2992. If you are mailing them, you will have the option of paying the $40.00 Filing Fee with a check (payable to Secretary of State), Discover card, MasterCard, or VISA card. If paying by fax, you may only pay the filing fee with a credit card and must fill out the Credit Card Authorization form included. Step 2 - Enter the Full Name of the nonprofit corporation being formed in Article 1. Then, in Article 1A, report the Physical Address of the Principal Office for the forming nonprofit entity. Step 3 - If you have attained a North Dakota Commercial Registered Agent then fill in this entity’s Full Name in Article 2A, then proceed to Step 5. If you have obtained a North Dakota Noncommercial Registered Agent then skip Article 2A and fill in Articles 2B and 2C in Step 4. 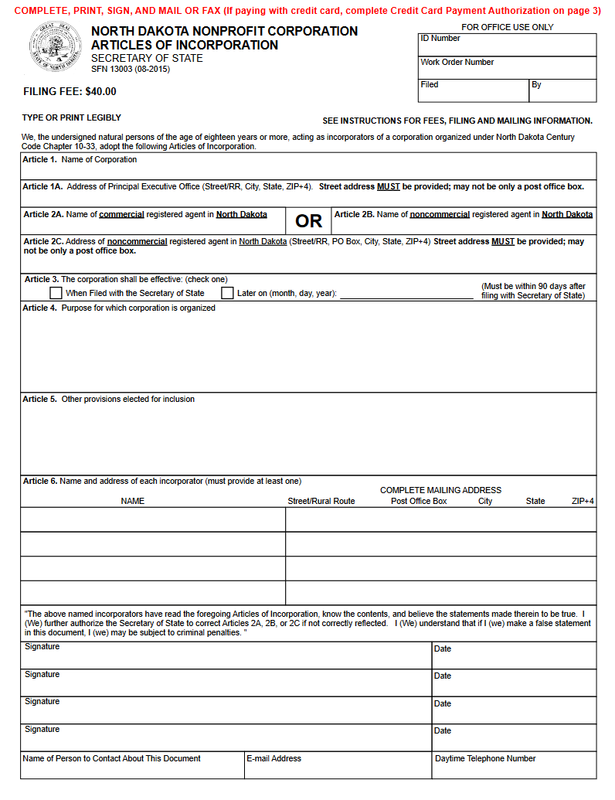 Step 6 - In Article 3, check the first box if you would like the articles of incorporation to become effective “When Filed.” If you would like a later Date of Effect you may choose one within 90 days of filing by checking the second box then entering the desired Date of Effect on the space provided. Step 7 - In Article 4, report the Purpose for forming this nonprofit corporation. A general purpose is acceptable however it is highly recommended to be specific. Step 8 - Article 5 provides a space for documenting any additional provisions to the formation of this nonprofit corporation. You may need to provide specific language for the IRS if you wish to apply for Tax-Exempt Status in the future. Step 9 - In Article 6, provide a complete listing of the Names and Mailing Addresses of all the Incorporators of this nonprofit corporation. If there is not enough room continue this on a separate sheet of paper. Step 10 - The next box will contain a binding statement regarding the Incorporators named and the articles. Below this each Incorporator must Sign his/her Name and provide a Date to the Signature. Below this, enter the Full Name, Email Address, and Daytime Telephone Number for a Contact Person that may reliably coordinate with the North Dakota Secretary of State. Step 11 - Gather all documents that must be submitted with the completed North Dakota Nonprofit Corporation Articles of Incorporation | Form SFN-13003 then either mail or fax the submittal in to the North Dakota Secretary of State’s Business Registration Unit. You may pay the $40.00 Filing Fee with a check made out to “Secretary of State” or with a Discover Card, MasterCard, or Visa if you are filing by mail. 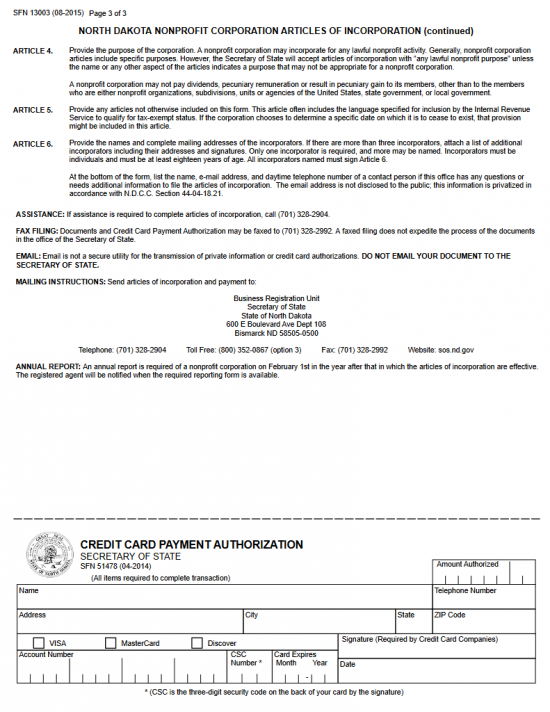 You may only pay with a credit card if you are faxing these documents in. If paying with a credit card, you must complete the Credit Card Authorization form which will require the Amount, Card Holder’s Name, Address, and Phone Number, the Type of Card used, the Credit Card Number, Security Code, and Expiration Date to be provided along with a Signature (of the card holder) and Date for the Signature.